For all 43 B&B hotels in Krakow, we show actual room availability. The nightclub with the intriguing title "66" is another interesting place. Here are played only the most modern songs, and fans of dancing have rest on a huge colorful playground. There are mild sofas in a cozy hall. Here guests can rest from dancing and watch the club’s entertainment program. The music in the club Clu does not stop until early in the morning. Every evening various music styles are played here. The club’s bar has a great menu with widest choice of drinks, and the virtuoso bartender never ceases to amaze guests with original cocktails. Faust is one of the biggest entertaining clubs of the city. It has everything you need for relaxation- a spacious dance floor, a beautiful bar with large selection of cocktails, a cozy café, and even a terrace. Within last several years Krakow Aqua Park has become one of favorite places for family holidays. Huge pools, slides, play areas for children and a well-equipped garden – this is a paradise for fans of water sports and hot sun. Shoppers will enjoy visiting local shops, where they can buy designer clothes, perfumes and trendy jewelry. In MediaMarkt supermarket you can buy various appliances, and Geant shopping complex offers visitors widest choice of different products, from clothes and shoes to souvenirs. Call us via the telephone number below or book online your Bed and Breakfast hotel in Krakow, Poland - cheap and without reservation fees. 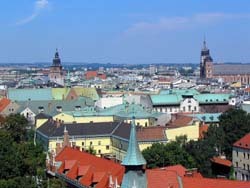 OrangeSmile.com provides 43 inexpensive, comfortable and affordable B&B accommodation and lodging in/around Krakow.